These jack stands can support and hold most cars and trucks safely off the ground. 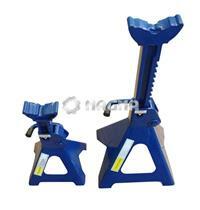 It suitable for the automotive service, maintenance and repair industry. Ranger jack stands feature a legendary solid design, welded steel construction and a ratchet & pin safety mechanism to keep them locked under load. Meant to work as a team, pairs of ranger stands come in capacities of 6 tons. 6. Height range is 15-3/4" to 24-3/5"